Boat Graphics can create an exceptional, striking first impression when installed the right way. Graphic Installation offers you a first-rate, nationwide boat graphics installation. Whether you need installation of boat graphics decals, boat name graphics, boat side graphics, boat signs graphics or boat lettering graphics anywhere in the U.S. our skillful and experienced team is here for you. From now on, your pontoon boat graphics wraps, bass boat graphics, and boat hull graphics can be installed perfectly to advertise your brand or pass the message you care about. If your business is dependant on boats and you have one boat, several or the whole boat fleet, it is a smart idea to install boat graphics and get maximum visual exposure. Also, if you have a private boat, you may wish to put your signature on it. The concept of presenting your name or brand through boat graphics is an excellent idea which goes hand in hand with modern trends in marketing. Stand out from the crowd and present your brand in an unrivaled manner. Finding the best boat graphic installation service will be your strongest trump card. Contact us today. The Best Nationwide Boat Graphics Installation Services in the U.S. 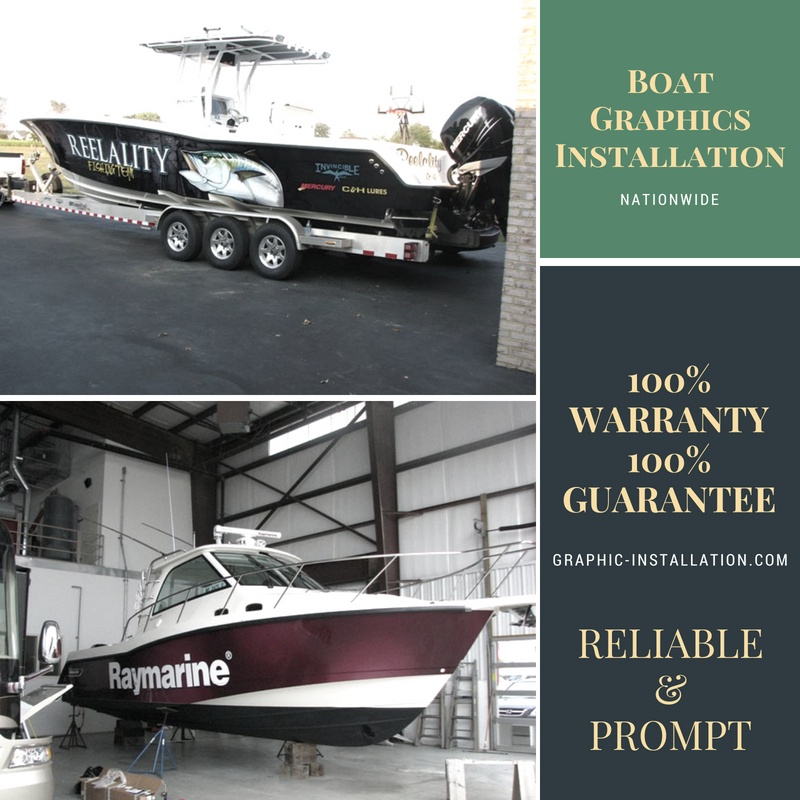 Whether your custom boat graphics and boat signs need to be installed for the first time or you need a replacement boat graphic installation, Graphic Installation team is the best installation team for the job. We will respond to your requests promptly, give you fast turnaround time, the lowest prices on the market, and accept your request regardless of where you are located. Our boat graphic installation team travels across the United States to provide top-notch boat graphic installation service for everyone who needs it. We install Boat Graphics at the highest standards you can get on the current market. Whether you need a decal or a full boat wrap, we can cover your boat and change its appearance in line with your expectations. Graphic Installation team is specialized in boat graphics decals installations, custom boat graphics, and vinyl boat graphics. In case you need a boat name, boat lettering or boat sign decals and graphics, don’t worry, we can install it as well. Maybe you need boat side graphics or some interesting boat stripes and graphics? Again, no worries, we can take a good care of your boat’s appearance by seamlessly installing boat graphics of your choosing. We know that many materials can be extremely delicate until they are fully installed. When choosing your perfect boat graphic, you will see different adhesive properties, material thicknesses, and pressure sensitive behaviors. This means that each material type has its specific limitations. Our graphic installers have vast experience that they want to share with you by recommending the most appropriate material for your boat graphics installation project. Graphic Installation professional installation team makes sure to secure that all boat graphics are perfectly installed. We know that this is the only way for boat graphics to last for years to come. Even if you get the most expensive vinyl boat graphics, they won’t look good and will not last long if they are not installed properly. Less experienced boat graphics installation teams can devaluate your investment by not installing graphics correctly. That simply never happens when Graphic Installation team takes care of your boat graphics installation! Many years of experience with various installation projects and professional authority expertise guarantees your 100% satisfaction. In case you need a replacement boat graphics, we can wrap your boat again and make it just perfect for you. We provide boat graphics installation services regardless of the kind of your boat. We offer a quality pontoon boat graphics wraps installation, as well as bass boat graphics installation. Our expert teams can also perform excellent boat hull graphics installation. Use themed designs, place a name on your boat, design boat lettering, hail port names, registration numbers, or anything else! Anything you choose will look great when we install it. Name your boat, whether it’s a fishing/bass boat, speed boat, pontoon boat, ski boat or a personal watercraft. The uniqueness and effectiveness of your appearance on the water are guaranteed. Using Graphic Installation installation services, your company brand will become famous on the water. And not only that, investing in boat graphics installation with us will bring you years of satisfaction, first-rate experience, and great value for the invested money. Graphic Installation is a nationwide certified installation service company, well-known for its professional and efficient installation work. Our company has been installing various visual applications for years. What we can offer is proficient teams, modern tools, and more than fair prices for our installation services. We are very proud of the fact that we successfully deal with clients from all the states around the U.S.
Graphic Installation crew of installers is enthusiastic, well-trained, prompt, and reliable. Years of huge experience, correct planning, professional and flawless installation is what we can provide for you as we do for all our esteemed clients. All you have to do is to call us and book our services. We are available 24/7 and give a 100% warranty and quality commitment. Graphic Installation is always there for you to make your dreams real. The years of vast and diverse experience and our constant strives to achieve better quality results and to grow day by day with each installation we deliver have made us unique and recognizable in an ocean of similar companies. Whether you need boat graphics wraps for your private boat or you need a proper branding or rebranding for your company boats, don’t forget to ask for our professional installation help. According to our wide range of satisfied clients, we at Graphic Installation can provide you with outstanding customer service. We are dedicated and eager to delivering our clients with the highest possible quality of service. So, choose the best, book our installation services now. You can find us in Clifton NJ and Boston NY but we will come to you wherever you are located in the U.S. Feel free to contact us or call us at (888) 888-5715. If you are thinking of branding your company boats, we are here for you to properly install them. Our installation services will ensure the boat graphics you chose last long and double their value. Maybe you want to name your private boat and make it more fun? We will be happy to make your idea come to life! An entire boating community can admire your graphics! All you need to do is to contact us. We can wrap your boat and cover it either completely or partially. The decision is up to you. Since our teams are available 24/7, we guarantee a fast and efficient delivery of wrapping your boat. We will respond quickly, give you fast turnaround time, and low price. Easily handling urgent requests 24/7, on workdays and on weekends, is what sets us apart from our competition, among other things. 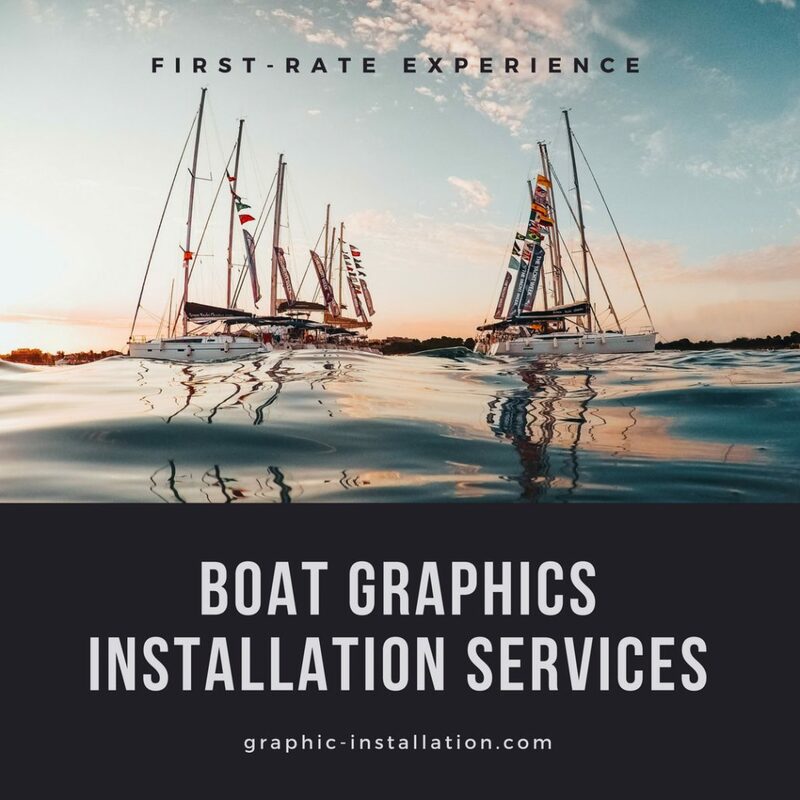 Regardless of the size of the boat graphic installation job, our committed, tireless, professional, and experienced installers will take care of it in no time.